Home Nutrition Vitamins and Minerals Is Your Body Vitamin Deficient? Is Your Body Vitamin Deficient? Most people seem to think that vitamin deficiencies are a thing of the past. But unfortunately the sad truth is that the majority of the world’s population has a vitamin deficiency of some kind. This is basically down to poor diet. OK maybe you eat well, but there are other factors to take into consideration (such as your health conditions and age) that can have an impact on your body’s ability to absorb the vitamins that are in your food. Being vitamin deficient can alter our bodily functions and its processes at the most basic cellular level, including enzyme function, digestion, water balance, new signaling, and metabolism. It is important for our body’s function, development, and growth that we resolve these deficiencies as quick as we can. 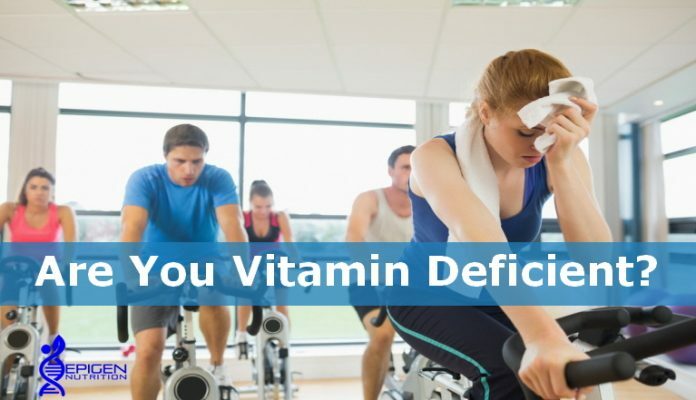 Vitamin deficiencies can end up leading to diseases, such as osteoporosis from a lack of vitamin D and calcium, as well as low iron counts leading to anemia, that can be a drain on your energy. There are quite a few telltale symptoms related to nutrient deficiency, let’s have a look at the most common ones. We need calcium for the maintenance strong bones, controlling nerve function and muscles. Signs of having a calcium deficiency can include muscle cramps, poor appetite, fatigue, and abnormal heart rhythms. A good way to combat a calcium deficiency is by getting ample servings of yogurt or whole milk each day. Some other excellent sources of calcium include dark, leafy greens, cheese, and calcium-fortified orange juice. Vitamin D is another vitamin that is crucial to our bone health. Long-term vitamin D deficiency can lead to a softening of bones, but short-term deficiency symptoms include muscle aches, muscle weakness, and fatigue. There are several ways to get the vitamin D your body needs, such as eggs, fortified milk, and eating fatty fish like mackerel, tuna, swordfish or salmon a couple of times a week, plus taking advantage of any sunshine whenever it comes out, making sure not to forget the sunscreen. Vitamin D also helps with the absorption of calcium in the gut. Potassium works to keep the heart, kidneys, and other organs functioning properly. Short term potassium deficiencies are common during bouts of vomiting, diarrhea, taking antibiotics, and sweating excessively. More serious potassium deficiencies could be a result of kidney disease or eating disorders. Avocados, spinach, bananas, sweet potatoes, milk, whole grains, peas, vegetables, and beans are all excellent, natural sources of potassium. When iron levels drop too low your body is unable to carry oxygen effectively, which affects the body’s ability to make red blood cells. Low iron level can lead to anemia, which causes fatigue. If your hair is thin and dull and your skin is pale, then you may be iron deficient. Folic acid is especially important for women in the childbearing age bracket. Prenatal vitamins contain a substantial dose and deficiencies cause decreases in cell numbers, as well as large red blood cells. During pregnancy, this can have an impact on neural tube defects for the unborn. Folic acid deficiency symptoms include gray hair, mouth ulcers, fatigue, a swollen tongue, and poor growth. Magnesium is a much needed mineral that’s crucial to helping the body function properly. It helps keep our blood pressure regulated, our bones strong, and our heart rhythms steady, and these are just some of the many functions it is responsible for. Signs of deficiencies include fatigue, nausea, vomiting, and a loss of appetite. Great sources of magnesium include nuts and seeds, dark leafy green vegetables, whole grains, and legumes. You may also find it added to some breakfast cereals and other fortified foods.